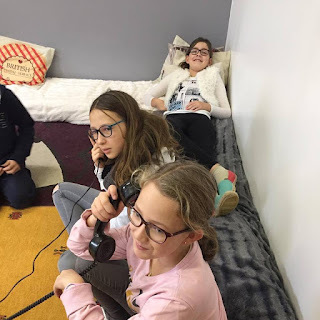 Avec mes élèves du groupe Parrots (CM-6ème), nous poursuivons nos petits jeux de rôles en anglais (role-play). Cette fois-ci, on apprend à converser en anglais au téléphone. En plus, ce petit "role-pay" a l'avantage d'inviter les élèves à être bienveillants avec leurs camarades - ce qui ne fait pas de mal dans la société dans laquelle on vit ! Actor 2 -Hello. Can I speak to ______________, please? Actor 2 -Hi, this is _________________. Actor 1 -Hi ______________, what’s up? Actor 2 -________________ is sick. Actor 1 -That’s too bad. Actor 2 -Em… How about going to see her? Actor 1 -That’s a good idea! What time shall we meet? Actor 2 -How about at two? Actor 1 -Sounds good. Let’s meet at the bus stop. Actor 2 -Okay. See you then! Actor 2 -How are you? Actor 3 -I’m okay now. I can go to school on Monday. Actor 2 - ______________, here’s an apple pie. I made it for you. Actor 3 -Thanks. I like apple pie.